We know things taste better in the tropics. Great tasting food and tropical desserts come from great tasting ingredients like limes, oranges, mango, pineapple and other exotic fruits. Excellent fresh-peeled and even more delicious as a cool smoothie or refreshing sorbet. We take you from market to kitchen for your own tropical delight. 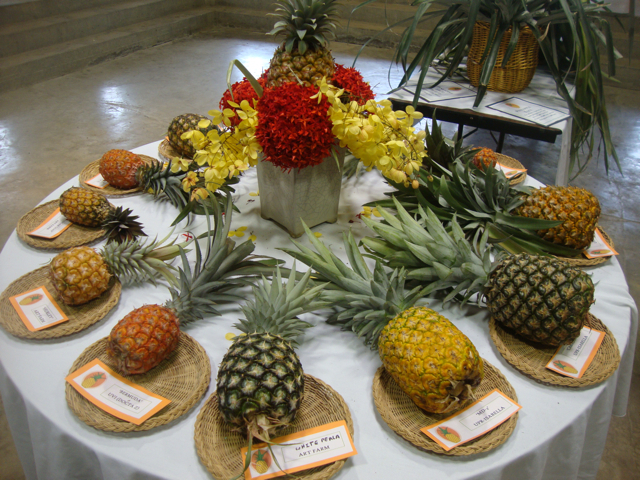 Did you know there are many varieties of pineapple and they are members of the bromeliad family? They usually arrive in your local store in various states of ripeness, and the variety of pineapples have a different shape, skin coloration, meat and seasonality. Generally speaking, the more compact the pineapple, the more concentrated the sugars. In Costa Rica they often serve small, golden amber pineapple as a snack or dessert, small grained, non-stringy with very tight openings in the meat; it’s incredibly sweet. An amazing alternative is the white pineapple, also cultivated in Hawaii. In the wild it has variegated leaves and coloration in the veins of the skin, including a reddish or purple tint as well as green and red hues. The white has the consistency of watermelon, not stringy, is quite juicy and tastes like piña colada; not too sweet, just right and perfect to enjoy “licuado” or smoothie-style. On one trip to the Osa Peninsula in Costa Rica, our friend Rafa of Pelican House showed us which pineapples were ready to cut and enjoy immediately and licuado. Machete in hand, the white rules. Its easier than you think to make a refreshing frozen sorbet in your own kitchen with just a blender and freezer. It’s a beautiful dessert, so light, creamy, acidic and smooth on the palate. Much better for you than processed treats because you can choose the type of sweetener and the amount that you prefer, if any. Follow our tips on juice handling and you’re ready to make a delicious tropical dessert just like you remember, maybe even better. For presentation, make a serving boat from a cleaned out shell of 1/2 pineapple, wash and freeze. Serve the sorbet or ice cream in the frozen pineapple boat and garnish with mint or citrus leaf. Pineapple is a good dietary source of fiber, vitamin C, B6, manganese, copper and thiamin. ¾ cup caster sugar (finely ground sugar) Substitute 1/2 cup extra light Agave Nectar. To make caster sugar place sugar in food processor and process until sugar becomes dusty at edges and finely ground but not powdered. Wash, peel and core the pineapple and cut into large chunks. Place pineapple into food processor and process until pureed. Add sugar and lime juice and mix well. Pour into a fine mesh sieve over a large bowl and press puree through the sieve to catch any fibrous pulp. This will give you a creamy mixture. Add the vanilla and the rum to the sieved pineapple mixture. Cover and place in refrigerator for at least one hour. Place chilled mixture into an ice cream maker and process according to manufacturers instructions. In a pinch, a blender will work to re-aerate the semi frozen mixture and then place back into freezer. The trick is to serve soon after it has set so it can be scooped out. If it is hard frozen you will need to let stand out of the freezer until it softens for scooping out. It is futile to try to extract home made sorbet from a hard frozen container.